Heavy gauge welded steel construction ensures rigidity and durability for many years of use. Files will accommodate letter or legal hanging files. A mechanical interlock system prevents more than one drawer from opening at a time to eliminate the danger of tipping. Drawers and shelves glide on heavy duty, full extension ball bearing suspensions. A single lock controls all openings. Locks are core removable and master keyed (order keys separately). Each opening is equipped with side-to-side hang rods for the folders. Optional front-to-back rods (H15CR) are available. 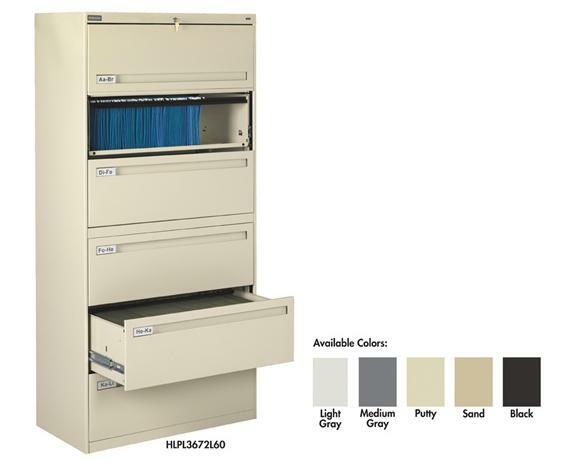 Drawers and doors have easy grip, full-width pulls with recessed label holders. Four leveling glides allow the unit to be leveled on uneven floors. 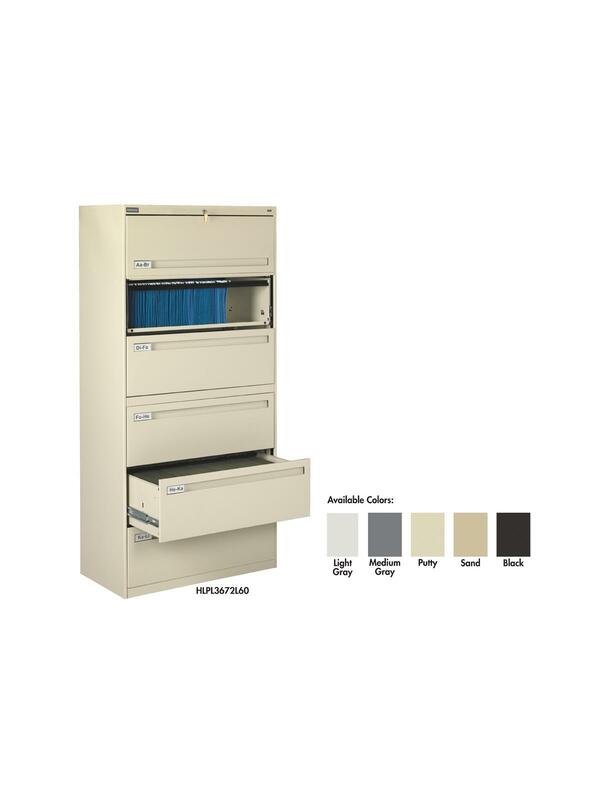 To reduce risk of tipping, order two drawer lateral files with counterweights (suffix "W") for all applications except under a work surface in a workstation. Five and six-high units have retractable door(s) with roll-out drawer on top opening(s). Durable powder-coat paint finish. Available in Light Gray, Medium Gray, Putty, Sand and Black. Choose an optional laminate top in Oak or Walnut to create a work surface on two and three-high files (see related tab). See Related Items tab for Lateral File Cabinets - Accessories and Master Key for Lateral and Vertical Files. 36 x 17-15/16 x 27-9/16"36 17-15/16 27-9/16"